In cooperation with our russian friends from The Spirit of Old School ,we are introducing you a short interview with Ultras Dynamo from Moscow. Read it in russian - here. Follow Ultras-Tifo in Vkontakte - here. - Hello mate, introduce yourself & tell us a little bit about your movement. - Hi there, my name is Sergey, I represent «Ultras Dynamo». Our organization was created in 2009 and was named at first as «Ultras Dynastia» («Ultras Dynasty»), but for some reasons we changed our name to what you can see now. At this moment we are the main group that is involved in active support during football and ice hockey matches. 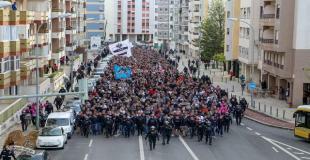 - If we are talking about our movement – we are a «Project» of Patriots (hooligans group). They are our main mentors and elder comrades. Also we have good relations with Patriots youngsters – «Molodci», they were also a part of «Ultras Dynamo», but now it`s an independent group. - What about your enemies? 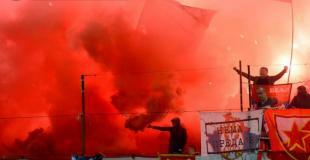 - Everyone knows it`s – Spartak & Zenit. From my point of view, for those who had ever heard about Russian Ultras scene – it`s not a surprise. I won`t mark anyone from the other side of the fence – they are all similar. But it`s another story. - Tell us about your stadium performances. - We try to use as much stuff as possible, no matter what rank of opponents we have. Because, as we all know, Russian proverb says «Stability is a sign of Skill/Mastery»(«Practice doesn't make perfect, practice makes permanent»). 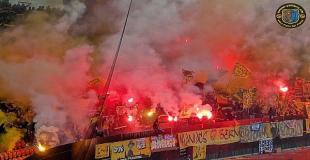 We try to teach guys to use stuff during matches, because we bring on our terraces much more stuff that our fans use. Off course on derby days and other top matches we make a performance. But because of some financial troubles it`s not always looks like as good as we plan. Also we don`t ask our Football Club and it`s official structures for any financial support, so everything we make – we do ourselves. - Can you rank your movement comparing with other movements in Russia? - Our home stadium is in Khimki city (Moscow «satellite» city,), so it kills attendance. - Small increase of new active guys on fan sector. - What are your thoughts about the scene in Europe? Who`s number one? - Which teams would you like Dynamo Moscow to meet in the future? With whom you never played before? - Due to the fact that we are not frequent visitors in Europe i`m not ready to name someone. Every city/FC is interesting on it`s own. Off course it will be a pleasure to meet our brothers-serbs from OFK Beograd, I hope it will happen one day. If talking about Russian clubs, here I can`t mark anyone and some of them I prefer not to see under no circumstances. (Russian guys know who I mean =).